If you are thinking of having an outdoor kitchen and BBQ for your home, you can count on Mike's Lawn & Garden. Outdoor cookouts with family and friends are always a special treat for any group gatherings. Adding this feature to your home or landscape is a good move since it can help improve family bonding. It can also become a great place for some outdoor activities, aside from cooking your favorite dishes. With the right amenities and strategic landscaping and design, your outdoor cookout activity will be an experience to remember. Designing an outdoor kitchen and BBQ entails a fusion of knowledge in designing an indoor kitchen and an outside garden. Some of the factors to be considered in the design are durability and functionality. This outdoor living space must be able to withstand the inclement weather conditions and other outdoor elements. We thus recommend using natural stones for your outdoor kitchen facade, particularly the use of pavers. Bricks are classic choices, but we also offer a wide variety of stone and concrete pavers for your kitchen design needs. A kitchen isn't complete without a sink. But we don't just install ordinary sinks. We only use stainless steel sink to ensure durability. On the other hand, you may also opt for ceramic sinks or with Spanish-style tiles for a more homey feeling at your kitchen. 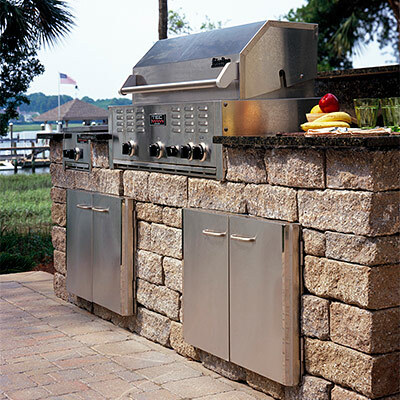 Outdoor Kitchens and BBQ Another excellent idea is to add a fire pit near your outdoor kitchen and BBQ. Think of nightly campouts with hot cocoa and s'mores. Skewers and grills are great additions to your fire pit for a multipurpose amenity. To add a taste of nature to your outdoor kitchen, adding water feature is a good option for you. 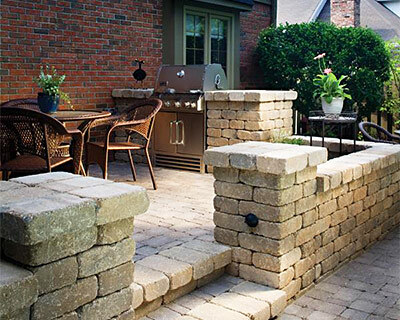 Stone-fenced ponds or even a swimming pool is a good idea to accentuate your outdoor kitchen and BBQ hub. All these and more can be included in the design and installation of your outdoor kitchen and BBQ. We highly recommend putting up a barbecue grill as a fixture to your outdoor kitchen--an indispensable tool for weekend barbecue cookouts and house parties. You may get a grill that is prefabricated or customized. The important consideration is to get one that has stainless steel skewers to ensure sturdiness and quality. Outdoor Kitchens and BBQ For such fixture, designers discourage the use of roofing directly above the grill, as emitting smoke is a major problem. We, therefore, recommend that the grill is strategically placed outside the roofing. Another option is to install kitchen ventilation systems or hoods. These will prevent the acrid smell of smoke from dispersing laterally throughout the kitchen area. We believe that every home deserves the best custom outdoor kitchen and BBQ. Mike's Lawn & Garden is a growing company that strives for excellence in every service that it provides for each customer in the Rhode Island and other cities of Massachusetts. We only offer superior products and services. And, lastly, you get innovative and unique ideas for your home or landscape improvement needs.